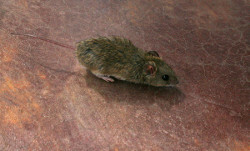 - Small light brownish-gray rodent with large ears, dark eyes and naked tail. - Weighing about 1/2 ounce and measuring 5-7" long (including tail). - Droppings, gnawing and tracks indicate activity. - Nesting constructed from fine shredded paper or fibrous material, located in sheltered places. - Manifests nocturnal habits, but can be seen in daylight when infestations are high. - Prefers cereal grain, but will "nibble" many different foods. - Keen sense of hearing, touch and smell. - Excellent climbers and swimmers. - Enters houses in fall when food supplies of seeds are scarce. Mice can enter through an opening 1/4" across. - In single year, female can have 5-10 litters of 5-6 young. - Young born 19-21 days after mating and are reproductive in 6-10 weeks. - Always keep spilled foods cleaned up. - Eliminate hiding places and clutter. - "Build out" all entry areas around doors, pipes, vents, foundations, etc. 1/4" or larger using steel wool, metal, wire mesh or concrete. - Cover edges of doors and windows with metal to prevent gnawing. - Snap traps, live traps and glue boards. - Place traps horizontal to walls in areas of activity (rarely venture more than 30' from nest). - Place traps no more than 10' apart. - Baits are anticoagulants where death often occurs in hiden areas (odor issue). - Mice are curious and will investigate changes to their environment. - Consider the nature of the contract when selecting control measures. - Client needs to be proactive for control measures to be successful.